As a person with a passion for cars, looking at examples like this can be quite hard. 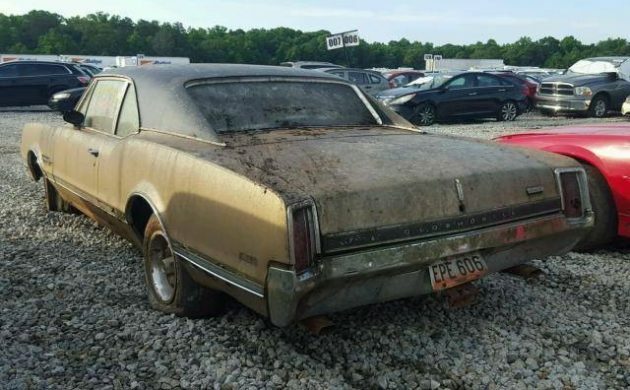 To see a ’66 Olds 442 in top condition makes this poor old girl look quite sad. 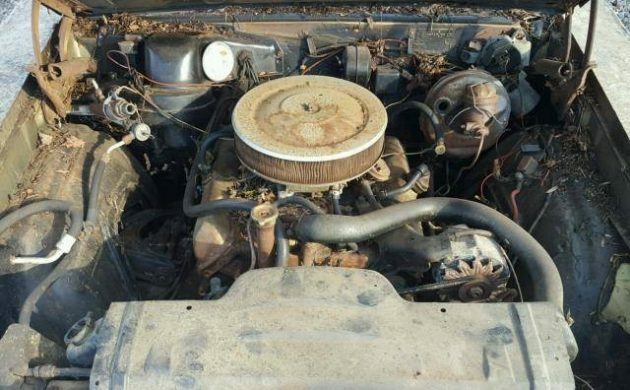 For sale here on Craigslist, this 442 comes with a clean title. The car is located in Florida, and appears to be located between Pompano Beach and Fort Lauderdale. 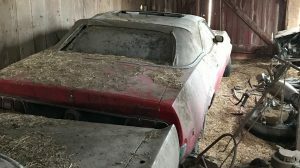 Barn Finds reader Michael has found yet another wonderful car for us to ponder over. So let’s ponder away and see if the $6,500 price is justified. 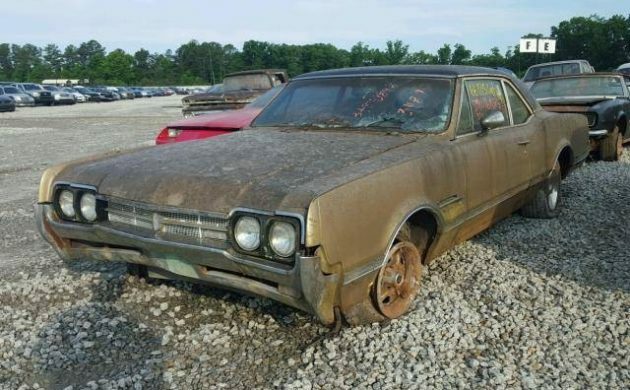 It is clear from the ad that this car has been located somewhere in Georgia and appears to be in transit to its advertised location. The owner is quite frank about the state of the car, basically they state that how you see it in the photos is how they bought it. For me the photos don’t tell us a lot about this car. It is really hard to sort out what might be rust and what is debris stuck to this car. 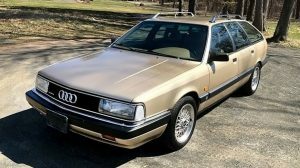 The seller would have done themselves a great favor if they’d left advertising the car until they got it home, given it a wash and then taken the photos. Having said that I think that there is some promise in this car because I think that the majority of what we see is actually foreign matter stuck to the car. I’d dearly like to see the underside of it. However, the sort of leaf litter and debris that has stuck to this car suggests that it has been sitting somewhere wet for an extended period. Couple that with flat tires that leave little room between the floor and the earth and things don’t look promising. One glance at the interior and the word trashed pops into my head. Things have obviously been nice in here at some stage, but time has marched on….and I think that it marched right through this car. The photo does us no favors since it was taken looking towards the sun. 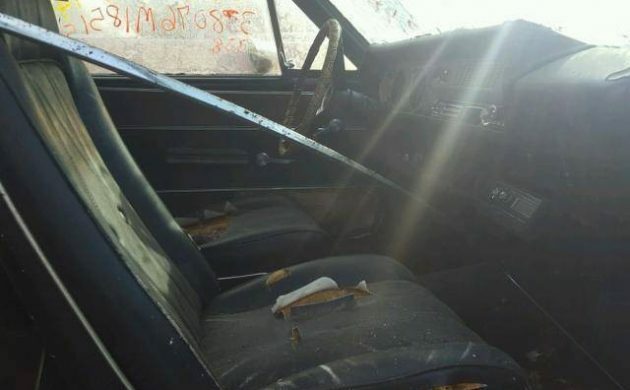 What we can see is that the dash pad is cracked and the minimum that the front seats will need is new covers, but I suspect that they will need more than that. The rear seat is in a similar state, and holes have been cut in the rear trims for speakers. On a bright note, the driver’s door card looks to be in reasonable condition. Beyond that there is little that we can tell from this photo. So to the engine bay and….oh dear. The owner states that he is 99% sure that this is a numbers matching car. If it is then that’s a positive. Apart from that it really doesn’t look promising. The engine bay really supports my earlier contention that this poor Olds has been stored in less that ideal surrounds. The amount of leaf litter and debris indicates that it has probably spent quite some time with the hood open to the elements. Once again the presence of mold indicates a damp environment, so the condition of the engine itself is an unknown. The odometer shows 36,000 miles, that must be original. I’d rather have the 4spd 442 that was featured the other day at the higher price. This looks like a Flood Car. Agreed. Doesn’t look like just wind could have deposited that much and type of sticky debris. This could lead to BF competitor startups like Gulley Finds or UDT Finds. Bingo! Saw it when I was eying the Camaro. Hurricane cars completely under flood waters. The right up says it has a clear title but Georgia doesn’t have titles for old cars. I wonder what the real story is. 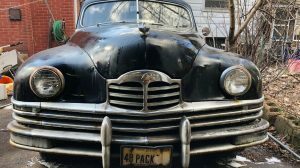 Thanks to David for identifying this as a Copart car. That’s exactly where it should be for about $500. It’s a post 2-door, not the better looking hardtop. It’s located somewhere between Pompano & Lauderdale next to the riverbed where it’s been lying for the last two years. Not a 400 sitting in the engine bay….. Call me when you get to $1000……..
Lovely looking car. 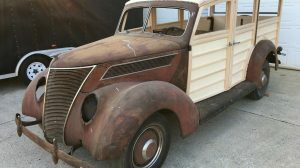 Assuming everything is there with the car, I imagine restoration could be done. The only changes I’d make would be upgrading the brakes, from drums all around to disc front and drum rear. I’d also upgrade the instrument cluster. Instead of the standard warning lights, I would give it proper gauges. David – good call….was thinking it looked kinda Co-part-ish…. 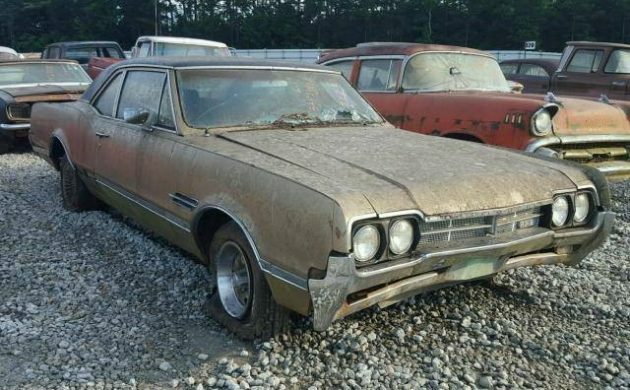 My first ‘good’ car in 1971 in Ft. Walton Beach Fl when I was in the Air Force was a clean, 53000-mile, $850 ’66 4-4-2 coupe like this, Cutlass Supreme trim, silver blue/white painted roof, new car trade-in at the local Olds/Pontiac store. it was a great car to ‘learn’ on, but in the end, I’m part of ‘why they’re rare’. This thing would have to be blown apart and every piece rebuilt in the method one would build a deuce roadster hot rod project. You’d have to be reeeeally devoted to 4-4-2s to make it worth the labor, the mold inhalation and the expense. Rough! 442 with no floor shift? 2 Door post is lighter than a 2 dr. hdtp. bout the only thing going for it. And the 442 only chrome trim on the deck lid. No Repop big $. You really can’t tell where the shifter is because of the crappy picture. With the Cutlass Supreme trim level I think the console shifter was standard. It looks like the dash vin has been chop sawed out through the windshield. Georgia must have sold it as parts only. Guy buys it, Florida issues a clean title sight unseen? Don’t they cross check insurance data bases nation wide? Or Florida says it’s so many years old so it’s exempt and can be retitled with a bill of sale. Must be a lot of flood cars on the market there if title washing is so easy. Cars of that era didn’t have the VIN at the base of the windshield, did they? That came later AFAIK. I do not know about GM but for Ford 1968 was the first year that a VIN tag was visible through the windshield.